The bassist and composer concludes his year-long Van Lier Fellowship with a performance of new work for three musicians. Known for the intense physicality of his performance and avant-garde playing, Brandon Lopez’s concerts at Roulette center on interrogating and often unraveling the structures of composition and performance. Tuesday’s culminating concert will focus on flipping the traditional structure of a trio, allowing sound to have equal importance to harmony and melody. He is joined by Jooklo Duo. 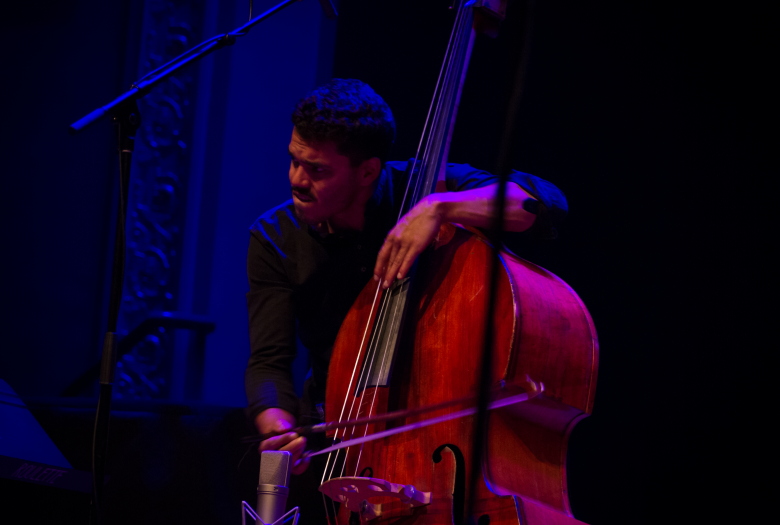 Improviser/Composer, Brandon A. Lopez, deemed the “Ubiquitous Free Improv Bass Ace” by the Village Voice and said to play with a “bruising physicality” by the Chicago Reader, was born and raised in the splendors of Northwestern New Jersey, in the shadow of NYC. It was there that he cultivated a taste for the left of center musics and subsequently, dug graves. He’s had the pleasures of working with many of the world’s luminary left of center musicians. Is a frequent collaborator (With Weasel Walter, Mette Rasmussen, Gerald Cleaver, Peter Evans, Ingrid Laubrock, Dave Rempis and many others) and has toured and played prestigious halls, DIY basements, festivals all across North America and the European Continent. He’s currently leads a piano trio dubbed “Mess” with Sam Yulsman and Chris Corsano. He frequently plays solo. He is also the 2018 Artist-in-Residence at Issue Project Room and was awarded the Van Lier Fellowship through Roulette this same year. He attended New England Conservatory. Virginia Genta and David Vanzan—self-taught students and torchbearers of the avant-garde, most notably the explorations of American free jazz—are Jooklo Duo. As a two-piece and as collaborators, Genta and Vanzan have been creating dynamic, mesmerizing improvised music that defies categorization for the better part of a decade. Brandon Lopez is a 2018 Roulette Van Lier Fellow. This duet is made possible by the Edward and Sally Van Lier Fund of the New York Community Trust.